The Cao Dai Temple at Tay Ninh is the spectacularly gaudy Holy See for the Cao Dai sect - a homegrown religion with around 2 million adherents that counts Jesus, Sun Yat Sen and Victor Hugo among its saints. Graham Greene popularised Cao Dai in the West in the novel The Quiet American when his character Fowler travels to the temple. The Cao Dai sect is fascinating both as a homegrown Vietnamese religion and for the role it played in Vietnamese history prior to 1975. 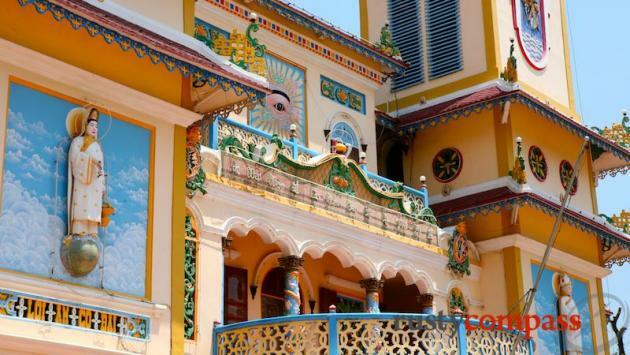 Emerging in the 1920s from a small group of spiritualists in Saigon, Cao Dai quickly amassed thousands of adherents in the Mekong Delta and around Tay Ninh, the location of its spiritual centre. Its cast of saints that includes Jesus Christ, Sun Yat Sen and Victor Hugo has excited the interest of foreigners for decades. Graham Greene even included a visit to Tay Ninh in his novel The Quiet American. The Cao Dai were very active in South Vietnamese politics prior to the end of the war in 1975. Their influence was strengthened by thousands of militiamen whose very existence seemed to contradict the religion's teachings of non-violence. Their virulent anti communism saw them suffer repression at the hands of the communists after 1975. In recent decades, the situation has improved markedly. The temple at Tay Ninh runs over nine levels and was completed in 1941. It's a gaudy structure that Greene attributed Disneyesque qualities. The all seeing Cao Dai eye representing the deity, is its central motif. A mural at the temple entrance shows Chinese independence leader, Sun Yat Sen, author, Victor Hugo and Vietnamese poet Nguyen Binh Khiem signing off on the foundations of the religion - God and Humanity, Love and Justice. 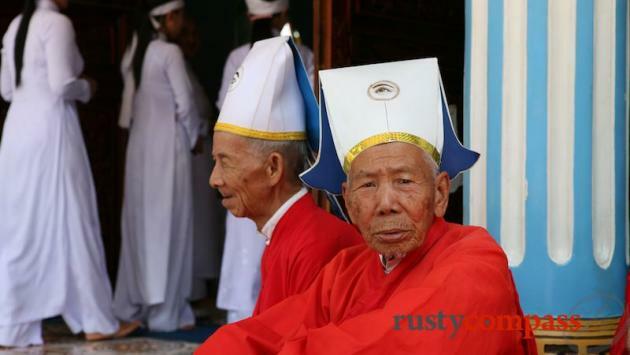 Estimates suggest around two million Vietnamese follow the Cao Dai religion. 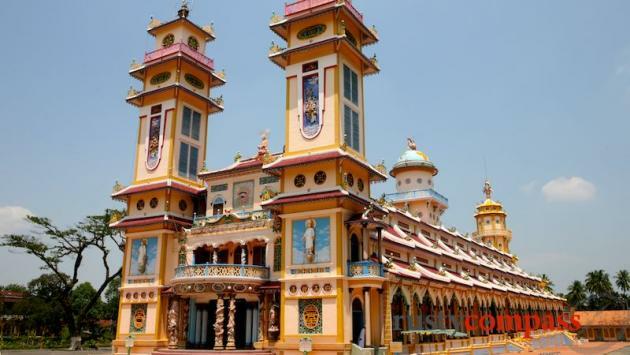 Small Cao Dai temples can be found all through the south of the country. The Cao Dai Holy See at Tay Ninh can be combined with a visit to the Cu Chi tunnels to make for a long but worthwhile day. After getting through the gridlock around Saigon, some of the rural scenery is very beautiful. 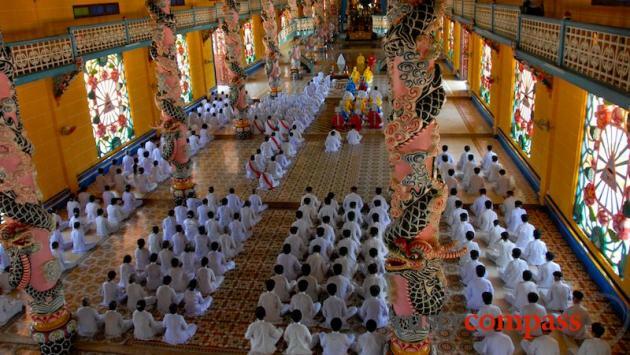 Religious services take place at the Cao Dai Temple every six hours from midnight. The midday service is very popular with visitors. 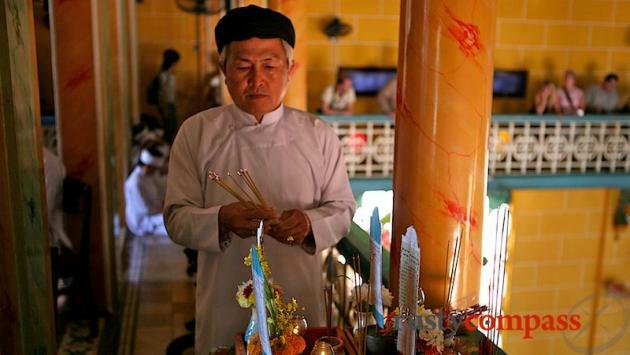 Cao Dai adherents welcome visitors to the service.